The Defense Advanced Research Projects Agency has begun its search for an anti-submarine bistatic sonar system that works to maintain a ship’s stealth while in operation, Military & Aerospace Electronics reported Monday. John Keller writes DARPA seeks companies to develop active sonar sources, signal processing and undersea communications technology for unmanned underwater vehicles under the Mobile Offboard Command and Control and Approach program. 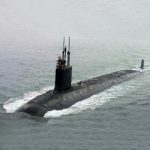 The program aims to help U.S. Navy submarines detect and track enemy submarines with the use of active sonar pings from UUVs while protecting its stealth, according to the report. Keller writes DARPA also wants submarines that can coordinate the functions of UUVs under a clandestine communications environment between the host submarine and supporting UUV. DARPA plans to award $12 million for the program’s first phase that is set to run for 15 months, the report said. Submissions to DARPA’s solicitation will close on March 15.